Serbian Private Equity Association is proud to announce its partnership with the CEE M&A and Corporate Finance forum. 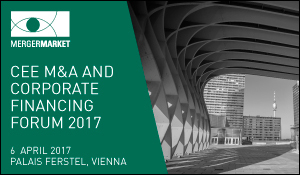 This event is being held at the Palais Ferstel in Vienna on the 6th April 2017, with a host of expertise in M&A situations in the region with a focus on how corporate finance will be affected in the year ahead. The forum is a fantastic opportunity to understand how macro-economic, political and global practices have affected local deals. Attracting 200 international attendees from 20+ countries, the event is a great opportunity to extend your network among contacts from across the region. It offers corporate finance executives a chance to understand the deal and financing landscape in greater detail. It offers bankers a chance to originate business with financial sponsor and corporate clients. And it provides advisors with a chance to share their expertise with a senior audience of clients.